Educational space and yard. High focus on start of large-scale expansion of National Monument Kamp Amersfoort. 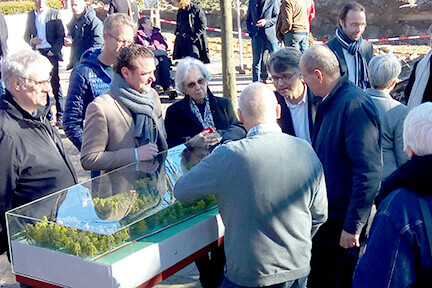 On Friday 15 February, former prisoner Wim de Ridder and the mayors of Amersfoort and Leusden gave the official go-ahead for the expansion of National Monument Kamp Amersfoort. Together, they unveiled the job site sign in front of a substantial crowd and toasted to a successful renovation. Initiators, board members, designers, process supervisors, employees, sponsors and volunteers came in large numbers. Many of them were closely involved in the final design by Inbo, landscape architect Cor Geluk of Juurlink [+] Geluk and Tinker Imagineers who were responsible for the interior design. During World War II, over 35,000 Dutch were held prisoner at Kamp Amersfoort, often in deplorable conditions. Hundreds died of deprivation or by firing squad. Thousands upon thousands of prisoners, often weakened, were placed on transports to camps in Nazi Germany. The expansion should be done by the spring of 2020, exactly 75 years after the transfer of the prisoners’ camp to the Red Cross.